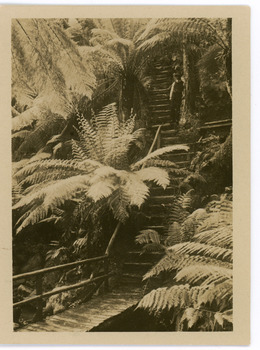 The Mt Dandenong & District Historical Society Inc. encourages and facilitates the collection, research, documentation and dissemination of images, written and oral records and objects representing the history of Mt Dandenong and the surrounding districts of Kalorama, Olinda, Sassafras, Ferny Creek and Tremont from first settlement to the present. The collection will be developed as an historical and educational resource for the community. Due to storage restraints the majority of the collection comprises early photographs and ephemera. The Historical Society holds meetings on the 1st Saturday of the month from 10am - 12pm at Farndons Community Hall. Cnr Falls Rd & Farndons Rd., Mt. Dandenong. All Welcome. Annual membership of MDDHS is $20 for an individual membership and $30 for a couple. 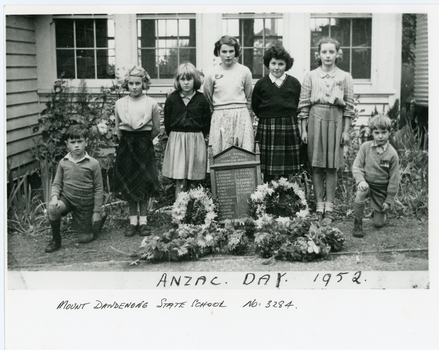 Copy of a photograph showing children from Mt Dandenong State School at an ANZAC Commemoration at the school in 1952. There are four girls and three boys standing behind the School WW1 Honour Board that is surrounded by wreaths of flowers. The names of five of the children in the photograph were supplied by Betty Munro after viewing the image on Victorian Collections. 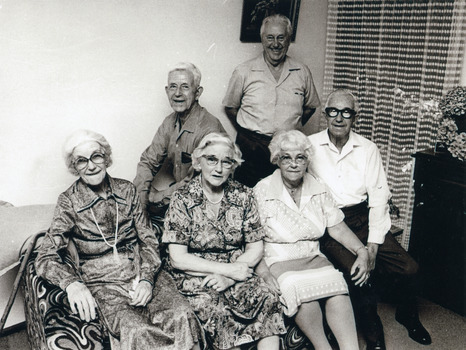 L - R: unknown boy, Cynthia Ramage, Betty Munro, Marion Moorby, Frances Barton (nickname 'Bubbles'), Joan Wenborn, unknown boy. 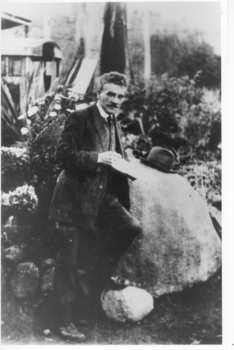 John Shirlow (etcher) standing next to The Rock at Sunnyside, the country home in South Sassafras (now Kallista) of John and Roberta Roberts. 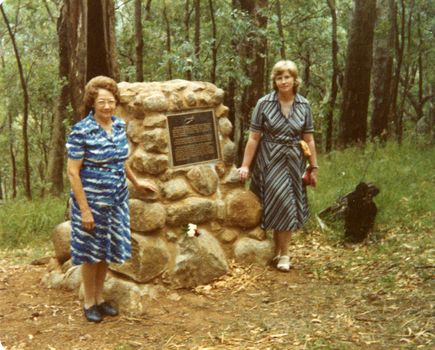 Visitors at the 1988 Service to commemorate 50th anniversary of the Kyeema Crash. 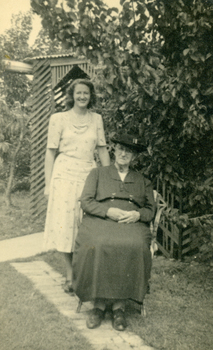 LHS - friend of Miss Delphine Goddard, sister of passenger Gordon Goddard and RHS- Patricia Hogan from Mt Dandenong & District Historical Society. 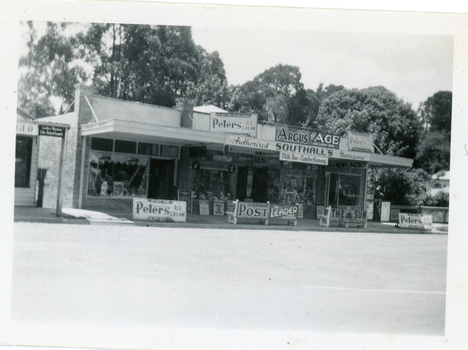 Small photograph from the Olinda township showing view of Southall's Newsagency with milkbar and confectionary. There are many old advertising signs clearly visible. The road is not yet made so this would place the date around the late 1920s. 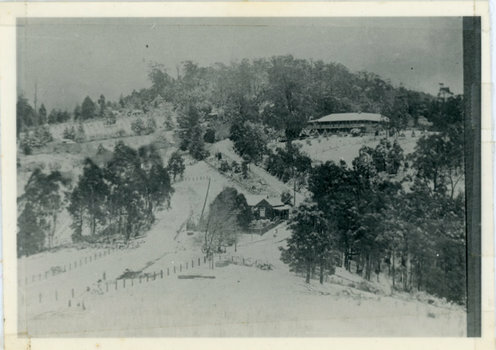 Copy of Rose Series postcard #182 showing Kalorama Gap in 1913. Haystacks in foreground with Mountjoy Guest House and Beulah Tea Rooms/Mt Dandenong North Post Office in centre. This photograph has a detailed inscription on the back handwritten by John Lundy-Clarke in 1974. 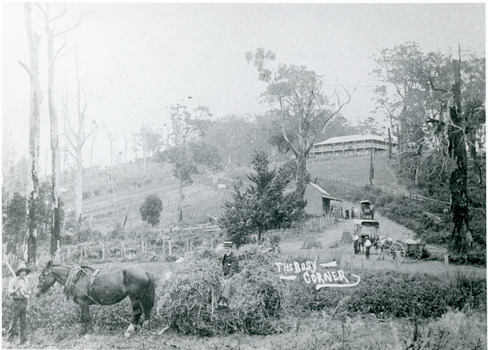 Kalorama Gap in 1913 The elm trees are in the centre of the picture. One of these is really two as two suckers of the further tree were twisted together by Fred Jeeves in 1898 and grew as one tree. The other was planted in 1880. The shop is the shop of Mrs Eliza Hand and daughter Florence. 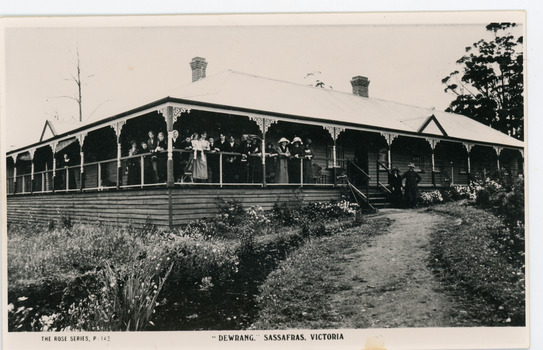 The closed in far end of the verandah was the Mount Dandenong North Post Office. The large house is “Mountjoy” owned and run by the Jeeves Family from 1908 till 1943. It was built in 1905 by the Paynters who sold to Ellis Jeeves in 1908.He moved his line of coaches from “Kalorama” his old homestead and housed the horses in a line of stables behind “Mountjoy”. Price’s house, which contained their shop, the first one on the mountain, opened 1906, can be seen faintly behind the pine tree opposite the bend in the road, which was the main road then and now is Ridge Road. The Price’s house just shows in two tiny pieces, one on each side of the pine tree half way up. The house to the right of and high up the pine tree is Walker’s cottage which exists today opposite Jack Kidd’s home at the far edge of Lt 2 Village Settlement and was between Main Road and Barbers Road which runs down the left behind the elms. Walker’s homestead can be seen near left edge of picture 2/3 way up. The roof of the Methodist Church shows among trees left of picture. This, like Mrs Hand’s shop was built on portions separated from Isaac Jeeves’ Selection “C” known as Jeeves Saddle. 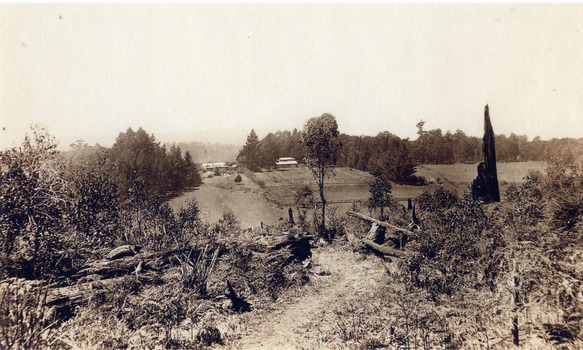 Copy of a postcard titled "Looking Towards Healesville". View taken from "Cherry Farm" hill looking across farm (now the Kalorama Memorial Reserve), which was the property of Thomas and Eliza Hand. Location recognised because of likeness to a painting. 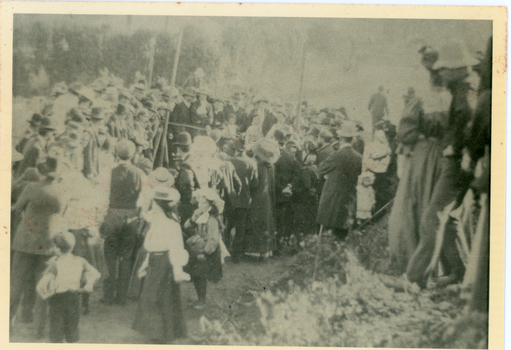 View of the crowd, both adults and children at the Olinda Sports carnival on Easter Monday 1909. The descriptive text on the reverse of this photograph was hand written by John Lundy-Clarke. 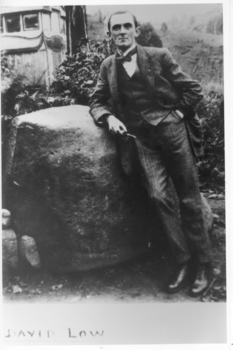 David Low (cartoonist) with pipe in hand leaning on The Rock at Sunnyside. Omnibus visible in the background. 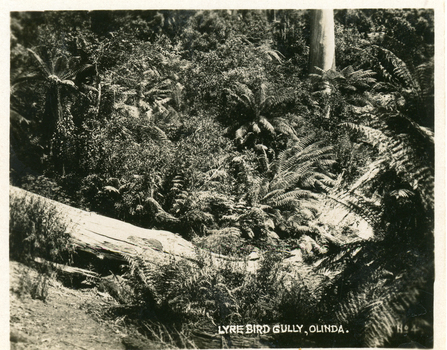 Small photograph, number 4 in Olinda series, showing ferns and fallen trees in natural bush scene. Number 4 in commercial series. Men L - R are Hubert Jeeves, Harold Jeeves, Norman Jeeves. Women L - R are Lily, Florence, Marjorie. 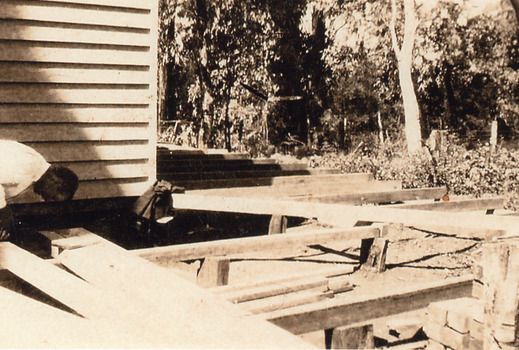 Photograph taken in 1974 showing John Lundy-Clarke standing beside the pit silo he dug in he 1920s on Dunbar's Lot 20 of the Village Settlement. The pit silo was to hold cut maize to turn into silage for a food supply for the cows in the winter. 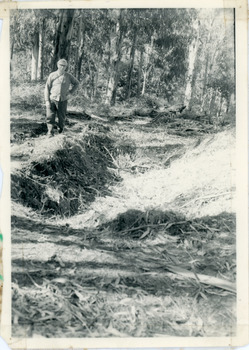 A 1974 view of the pit silo and its maker at Lot 20 of the Village Settlement (Dunbar’s lot) The trees in the background cover the landslide of 1891-1934. Close up view of unknown man working on an addition to the Robinson holiday house Kamanange. 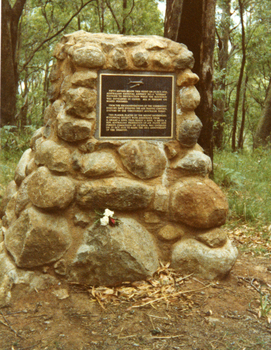 Cairn commemorating the crash of the aircraft Kyeema on the western slope of Mt Dandenong on October 25th, 1938. Photograph taken in 1988. Text on plaque reads: FIFTY METRES BELOW THIS POINT ON 25 OCT. 1938, AUSTRALIAN NATIONAL AIRWAYS' DC-2 'KYEEMA' PLUNGED TO DESTRUCTION WHILE THE MOUNTAIN WAS ENVELOPED IN CLOUD. ALL 18 PERSONS ON BOARD PERISHED. FROM THE RECOMMENDATIONS OF THE SUBSEQUENT ENQUIRY HAVE EVOLVED THE AIR TRAFFIC CONTROL SYSTEMS IN USE THROUGHOUT AUSTRALIA TODAY. 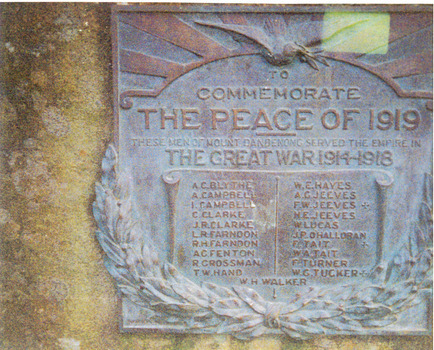 THIS PLAQUE, PLACED BY THE MOUNT DANDENONG HISTORICAL SOCIETY, WITH ASSISTANCE FROM G. GRAMP & SONS, THOS. HARDY & SONS, S. SMITH & SON, AUSTRALIAN FEDERATION OF AIR PILOTS AND FORESTS COMMISSION OF VICTORIA, WAS UNVEILED ON 25TH OCT. 1978 TO MARK THE 40TH ANNIVERSARY OF THE DISASTER. 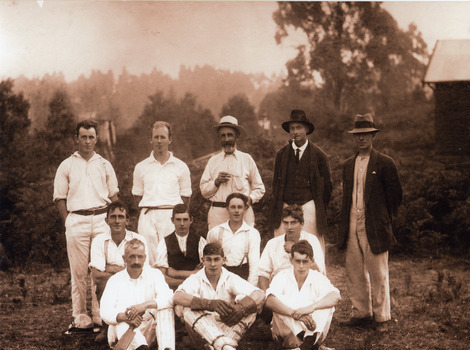 Photograph shows ten men in cricket gear & two in ordinary clothes. Names not recorded. 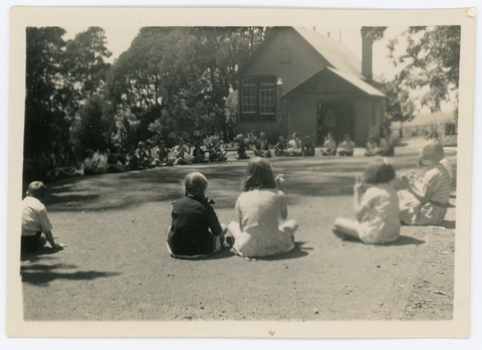 The grounds at Mountain Grange were used for sport long before 1939 when Lillydale Council purchased the property to use as a public reserve and it later became the Kalorama Memorial Reserve. St Matthew's Church Girls Friendly Society Outing with transport provided by Wally Breen's truck. 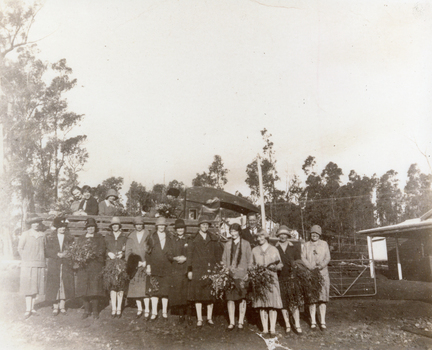 Scene shows group of girls in front of truck, some holding large bunches of flowers. circa late 1920s. 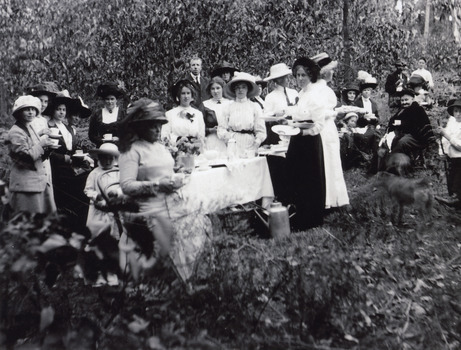 From back L - R Vi Hardon, Edna Eakin, Florrie James, ?, ?, Mrs Eakin, Sheila Shellow, Mrs Hamilton, Iris Dorey, ?, Mrs Wally Breen, Nora McLarty, Mavis Giddens, Wally Breen, Rita Shaw, Jessie Lyle. 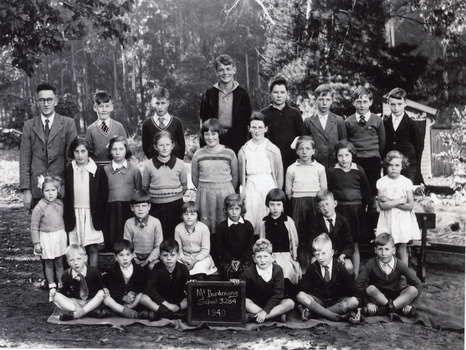 Group photograph of teacher and pupils at Mt Dandenong Primary School in 1940. A 9 hole golf course was laid out somewhere in the grounds of Mountain Grange. 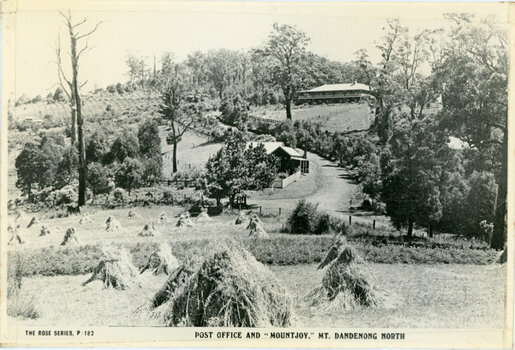 Landscape view of Ridge and Barbers Roads showing Mountjoy Guest House on crest, Mt Dandenong North Post Office, three delivery carts and people. Lower LH corner Fred Jeeves (standing), Theo Hand (on wagon) and Blossom (horse). Group of six people taken at Sunnyside, country home of John and Roberta Roberts at South sassafras (now Kallista). 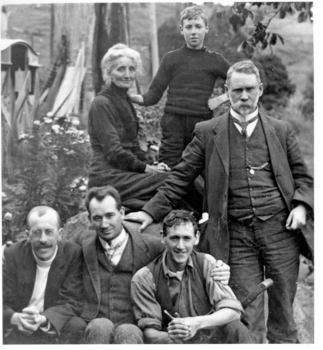 Front L to R: Robert Croll, C. Web Gilbert, Frank Roberts. Back L to R: Mrs Roberta Roberts, Bert Roberts, J. G. Roberts. 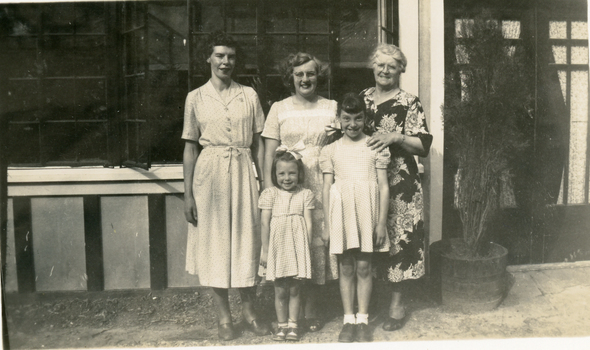 Group of three women and two young girls posed outside the Quamby café at Olinda c1950s. 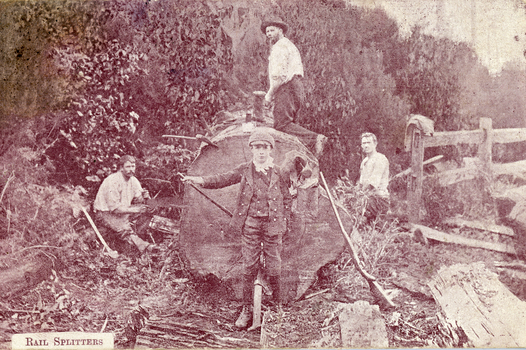 Postcard with title RAIL SPLITTERS printed on the front showing three men and a boy at a large, sawn tree. They all have implements used for cutting and sawing. There is a long gun leaning on the front of the felled tree. The postcard was written by Fred Dorey and sent to his sister Mary.in 1905. 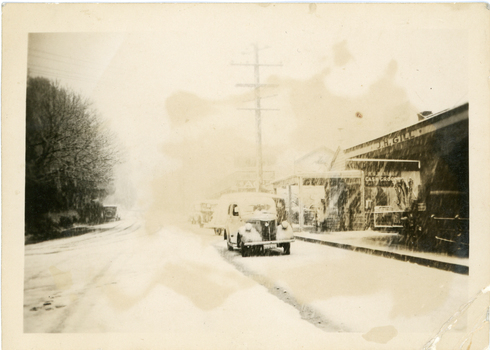 View of Kalorama Gap under snow taken in 1921. Mountjoy Guest House is at top right and Beulah Tea Rooms is in the centre. This photograph has a detailed inscription on the back handwritten by John Lundy-Clarke in 1974. Kalorama Gap under snow 1921 The leafless elm trees are low in the centre and the dual nature of the nearer one can be clearly seen, two small suckers of the older farther tree being twisted together in 1898 by Fred Jeeves. The older tree was planted 1880. Mrs Hands shop can be clearly seen, which was the Mount Dandenong North Post Office. The old Main Road runs up the centre of the picture and turns to the right and disappears behind “Mountjoy” the big guest house built by Paynters in 1905 and sold to Ellis Jeeves 1908, whose family ran it till 1943. At the bend of the road behind the big pine tree and the dark blackwood can be seen faintly the gable of Price’s house that contained the first shop on the mount. Above it is H Walker’s cottage on Ridge Road that still exists, his homestead is on the left of the picture on the same level. Below this house and to the left can be seen Ted Prices hay and corn store. The present estate agency lies between these two buildings, on the road which had recently been built. This can be seen winding from the lower left corner of picture to the left of the elms. The CRB had recently fenced the road and this is clearly seen as it circles behind trees in the left centre. Barber’s Road crosses CRB Road to the left of the dray under the leafless elm and the Coach Road dives down to the right just behind the pair of blackwoods to right of the elms. The picture was taken from just above the boundary of Isaac Jeeves’s selection Crown Allotment “C” (Jeeves Saddle) which stretched across the Gap to the other side of Mrs Hand’s shop, monopolising the gap from 1871 to 1879. Price’s house remains partly as the small house – “Mirra Laken”. Close up shows the names of local volunteers in the AIF. Note: 'Peace of 1919". Official peace with Germany was June 29th, 1919. 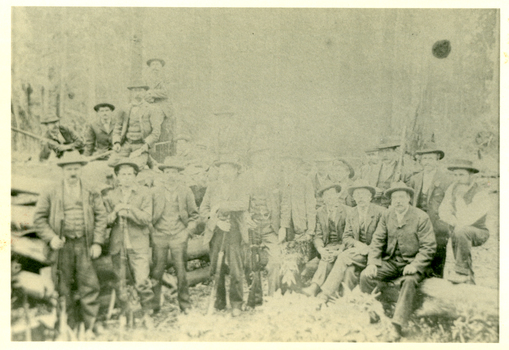 Hazy photograph of Olinda and Mt Dandenong men at the Olinda Rifle Range 1909.